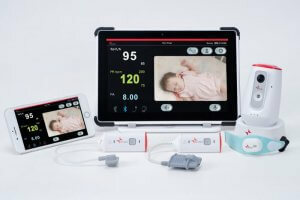 Aulisa Medical USA Inc., released the first of its Guardian Angel Rx line of wireless, wearable continuous vitals monitoring and alarm systems to improve patient safety and address the evolving health care landscape. Aulisa’s current line of vitals monitoring systems provides wireless, continuous remote monitoring to avoid inconsistencies in spot-checking vitals and provide earlier detection of patient vital sign abnormalities and give alarm to care-takers. Aulisa’s first two Guardian Angel vitals monitoring systems are the GA1000 Rx for local use (within 32.8 foot/10 meters radius) and GA2000 Rx with remote monitoring capabilities via Internet or Intranet, as well as other additional features. Unique serial code on sensor that pairs with tabletop display unit (included in system) to ensure exact patient pairing and to avoid patient data being sent to wrong display unit. The Guardian Angel Rx GA1000 is FDA cleared and now available for purchase; the GA2000 has FDA clearance pending and is scheduled for a Spring 2019 release. Visita Aulisa at CES 2019 at Eureka Park, Booth #51322.